Tommy Eveld had been planning to propose to girlfriend Erica Nunn for six months. Two days ago, he saw Carolina Mudcats third baseman Weston Wilson propose to his girlfriend after she threw out the first pitch, and he couldn't help but think Nunn might catch on. "I was just completely blown away like, 'No way,'" Eveld said. "I was still excited about the idea, but in the back of my head, I was worried that Erica was going to see this and it would be a big tip-off. But I didn't really think too much into it. I already had the plans made to do it, and when I saw someone else did it two days before me, I still went with it." Nunn was none the wiser, however. 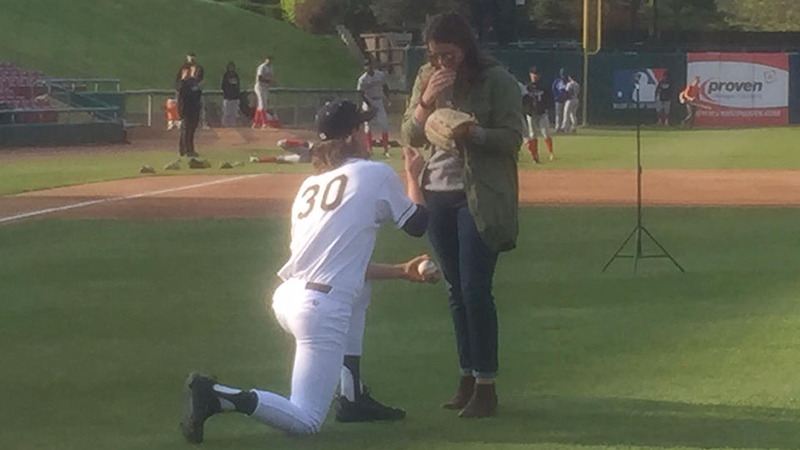 The Class A Kane County closer and University of South Florida product caught his girlfriend's first pitch in a customized glove he purchased for the occasion and walked out to the mound to give her the surprise. "I kind of winged it," Eveld said. "I wasn't quite sure how or when I wanted to do it -- it was actually my little brother's idea to get the team on board and let her throw the first pitch out. I ordered her a glove because I play catch with her in the offseason -- she played softball at USF -- and on the thumb, it had her first initial and my last name. I caught the first pitch with the glove, showed her the name on it and got down on one knee." Despite Eveld's initial fears, Nunn was still taken aback, even though the couple had been ring-shopping in recent months. "She had no idea, she thought the ring was still back at my house in [Lutz,] Florida," Eveld said. "She sort of put together a design of what she wanted and I went in and hand-picked the diamond. She picked the shape, I picked the size -- and had it put together at a jewelry store. "She knew I had it, but she didn't know I had it here. The front office at Kane County was super excited about it -- really eager to just help it go smoothly and do whatever they could to make it perfect." That wasn't the end of the excitement for the 23-year-old stopper. He got to close out the 4-1 victory over the visiting Great Lakes Loons. "I just try to clear my mind of everything once I take the mound and not let anything affect me," Eveld said. "The last time it sort of went through my head was when I was warming up -- they played 'If you like it put a ring on it' while I was warming up. I ... sort of had to regroup and lock back in." The 2016 ninth-round pick made the first two outs of the inning look easy, inducing a first-pitch flyout by Saige Jenco and groundout to second by Zach McKinstry on his third pitch of the frame. In the prior five games he saved this season, Eveld hadn't allowed a run over 12 innings. "If it would've been a one-run game, it would've been a lot more pressure," Eveld said. "But the offense came through big at the end of the game, giving me two more insurance runs to work with, and that helped a lot to take some nerves out of it." After tossing ball one to Davis, Eveld came back with two strikes to get ahead of the Loons second baseman. With the count 3-2, the 6-foot-5, 195-pound right-hander got Davis looking to punctuate his exciting day. "That was awesome. As soon as I got the strikeout, I was thinking to myself, 'I need that ball,'" Eveld said. "That ball will definitely end up in one of my trophy cases back home. Me, my older brother Bobby, my little brother Wesley and my older sister Tiffany have trophies in there. We have a game room with a pool table where we collect our trophies and they go around the whole room around the wall, two or three trophies deep. "The ball tonight is one I'll keep on my dresser."